Kids eat a lot — and frequently. Kids stomachs are small, so it doesn’t take a lot of food to fill their tummies, but because they can’t eat a lot and they are burning energy so quickly, they are frequently hungry a lot more often than adults. This means even on short trips your car becomes the dinner table. Firehouse XPress Car Wash, an automatic car wash in Fort Collins, understands how hard it can be to keep your car clean when you have kids. 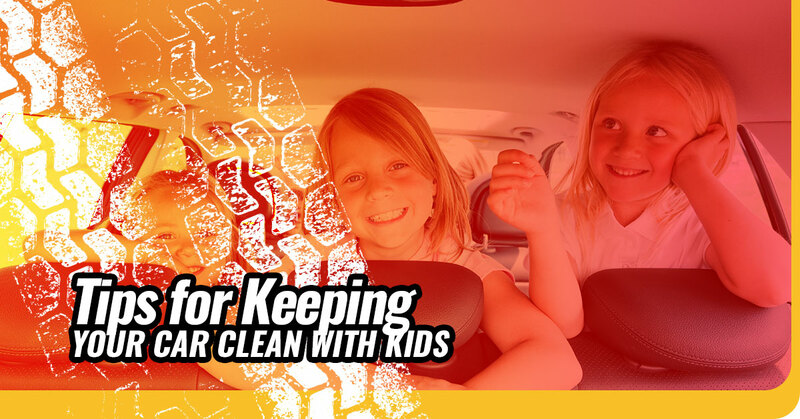 Below, we’ll offer up tips for keeping your car clean with kids. Visit us today for free car vacuuming! Invest in car vacuuming services. Crumbs will become a constant battle as your kids munch on goldfish, graham crackers, granola bars, and chips in the car. If you throw in food wrappers, candy packaging, and drink containers, your car can become a trash can on wheels rather quickly. Aim to vacuum your car at least once a week. Wipes will become your best friend. Wipes are the solution to most dirt problems when you have children, from wiping kids’ faces to their hands and even their feet. The cleaner the kids are, the cleaner your car will be. Wipes will be indispensable for food and drink spills, as a disinfectant, and for keeping the dust bunnies at bay. Invest in a trash container. This is a great time to teach the saying “A place for everything, and everything in its place.” By having a designated trash bag, trash can, or even a cereal box on hand, your car will be much cleaner without trash littering the floor like a tornado just came through. Draft your children to help. Even two-year-olds can use a wet cloth to help with cleaning. Make each child responsible for his or her area, which includes the floor. He or she must pick up any trash, wipe all surfaces, and help with car vacuuming. Turn your kids into micro car cleaning services, and your vehicle will stay clean. Firehouse XPress Car Wash has two locations in Fort Collins for car wash services and free car vacuuming to help you keep your car clean. We offer monthly unlimited car wash packages. We offer various levels of car wash services in order to match your driving style. For instance, if you mostly highway commute, the Lieutenant car wash is for you. It offers a quick car clean without the heavier duty car wash services we offer that targets dirt and mud build-up. Firehouse XPress Car Wash offers seasonal car wash service promotions that you can find by visiting our website. Firehouse XPress Car Wash was founded in Fort Collins by two firemen who wanted to make car washes easy, convenient, and fun. We are highly invested in the community of Northern Colorado as we donate a portion of our profits every month to local charities. If you know of a noteworthy charity or community event, let us know on our community page. Our mission at Firehouse XPress Car Wash is to offer great car wash services at great prices. Contact us today!